Serving Pittsburgh, PA, Washington, PA and surrounding areas. I represent people of all genders and ages in their divorces. And if I’ve learned one thing, it’s that no client is the same. In my experience, however, women in their 50’s or older struggle the most with divorce. In general, these are women who have been married a long time. Her life plan was to stay home and raise their children and take care of the household. Once the children grew up and were off to college or otherwise living on their own, she might get a part-time job while she continued to manage the house and looked forward to grandchildren and the day her husband could retire. This life plan is completely derailed when her husband files for divorce. Or in some cases, the marriage has been so abusive or unhappy that the wife has no choice but to file for divorce herself. In either scenario, she is devastated. She feels hopeless. What is a woman who is completely financially dependent on her spouse to do? It goes without staying that the first thing a woman should do is hire an experienced divorce lawyer. A divorce lawyer is your advocate. They can tell you what your rights are and what to expect. They will give you direction and tell you what to do next. I’ve been told on numerous occasions by women after an initial consultation that they feel so much relief about their situation after meeting with me. Even if you feel you can’t afford a divorce lawyer, at least meet with one for a one-time consultation. Am I entitled to support? If so, how much? Does my husband have to pay my attorney fees? What are my rights with regard to the marital residence? Is there anything I should be doing right now? What is your retainer, hourly rate, and/or fee structure? It’s helpful to prepare a list of your questions before you meet with the lawyer. That way, you won’t forget to ask something. Your divorce lawyer probably already gave you a good idea of how much Spousal Support or APL you are entitled to at your initial consultation. By the way, Spousal Support is support that the financially dependent spouse is entitled to once the parties have separated. APL (Alimony Pendente Lite) is support the financially dependent spouse is entitled to once a divorce complaint is filed and you’ve raised a claim for APL. There are some differences between Spousal Support and APL, but they are calculated in the same way. Once you’ve hired your divorce lawyer, the first thing they will do is file for support and schedule a court date. Support is calculated based on the net incomes or earning capacities of the parties. A person’s earning capacity is essentially the most a party can earned based on their education, skill and experience. Earning capacity is often an issue for financially dependent women in their 50’s, particularly if they are not working at all or are working part-time. For many women, they have advanced degrees, or made significant income before they started having children. The courts will explore whether support should be calculated based on the most income the wife has ever made, or whether she is able to work full-time. Typically, when a wife has been out of a certain field for many years, courts will not calculate support based on her highest earnings. However, talk to your divorce lawyer about strategy with regard to an earning capacity issue. Also talk to your divorce lawyer about asking the court to order your spouse to pay your attorney fees. Be prepared to talk to your lawyer about your education and employment history. If you have one, bring a current resume to your appointment. Do you have any extraordinary expenses? If so, bring them to your lawyer’s attention. The divorce process can take a long time, sometimes years. One mistake I see women make is that they wait until the divorce is over to start thinking about and planning for their future. Now is the time to start asking the tough questions. Can you afford to live in the marital residence based on the support you receive and the income you’re making (if any)? If you can’t afford it, what kind of job can you get? Is it possible or feasible for you to go back to school or obtain some vocation training? If so, can you start right away? 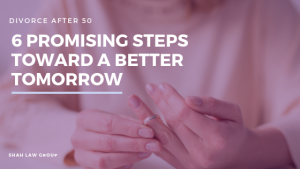 Women have to use the time while their divorce is pending, and while they are receiving Spousal Support or APL to start thinking about and acting on a plan for their future. Not only does it make sense financially, but showing the court that you have a plan will strengthen your claim for alimony. Most divorce cases settle without going to court. This means that the parties reach an agreement on how to divide their assets and debts and alimony. By going to court, it means that a judge decides. There is preparation involved whether you settle or go to court. This means that assets have to be valued and documents have to be exchanged. Gather information on assets – In addition to tax returns and pay stubs, your lawyer will need to see documentation of all assets, such as retirement accounts, bank accounts, vehicles, etc. If there is a marital residence or other real property, ask your lawyer about getting these assets appraised. Whether you settle or go to court, your goal is to get the most assets you can get, and the most alimony you can get for as long as you can get it. In PA, the court has to look at many various factors in determining how assets should be divided and whether alimony should be awarded. The fact that a woman has been a homemaker and raised children while her husband worked outside the home, and that the parties have been married a long time, typically favor a skewed distribution in the wife’s favor. Alimony is often favored for the same reason. Talk to your divorce lawyer about what you should ask for and what you should expect. Remember that in the eyes of the law, your contribution to the marriage as mother and homemaker has value. Although financially dependent women in their 50’s struggle initially with their divorces more than anyone else, they are the ones, time and time again, that I see come out on top. They work harder than anyone else and are always more prepared. One could argue that it is because they have more to lose, but I think it is because strength breeds in the face of adversity. If you find yourself in a marital dispute with nowhere left to turn, divorce might be the answer. Call us today to schedule a free consultation to get started on the right foot. Family law attorneys are experts in many different issues. They’ve dedicated their practice to helping families solve problems and create solutions. Whether you’re facing divorce or are in the process of adopting, an attorney can assist you. When seeking the help of an attorney, there are a few common mistakes that people make. Avoiding these mistakes ensures that you retain proper representation and that your legal troubles are handled correctly. Many people wait too long to hire an attorney. Instead of searching out the right representation as soon as the situation calls for it, they wait to see how things play out. Maybe they think that they can work things out without an attorney or maybe they spend too much time researching which attorney to hire. Either way, it’s important to hire an attorney quickly to ensure that you’re treated fairly throughout the process. While it’s important to hire someone quickly, it’s more important to hire the right person. There are dozens of attorneys out there. Chances are you probably know an attorney. Not every lawyer should be trusted with your case. It’s important that you find an attorney that specializes in family law, has passed the bar, and has experience in dealing with cases like yours. The attorney that you do hire should be able to give you some basic answers up front. Many people make the mistake of hiring an attorney that looks good on paper, but doesn’t give them the right information from the beginning. Whether it’s their financial policy or their strategy, a good attorney will always be transparent. Finally, don’t make the mistake of hiring an attorney that you don’t feel comfortable with. You’re trusting your finances and the future of your family to your chosen lawyer. It’s important that you trust them and feel confident in their ability to represent you. The Shah Law Group, located in Bethel Park, is your source for legal representation. Our practice was built on the philosophy that each client interaction should be handled carefully and efficiently. We continually strive for exceptional communication and compassion. No matter what your legal issues may be, trust the Shah Law Group to handle them. Explore your legal options by visiting www.shahlawgroup.com. My Spouse Left Me – Now What Do I Do? I recently wrote an article that offered some guidance for the financially dependent spouse who wants to get out of an unhappy marriage. I talked about taking money out of the joint bank account, taking the kids, and filing for support. But what do you do when you are on the other side of that scenario? We’ve all heard this story. It has happened to someone we know, an old friend or maybe a distant relative. It goes like this: Some poor, unsuspecting chump gets up in the morning, kisses his wife and kids’ goodbye then goes off to spend the next 8 hours or so at his job like he does every other day. But when he walks into his house at the end of that long hard day, he finds that the house is eerily empty and quiet. The furniture is gone. The wife and kids are nowhere to be seen. Even the cat is gone. He instantly feels panicked and fears the worst. Were they robbed? Where was his family? He runs upstairs to check the bedrooms. The children’s rooms are mostly empty of furniture, clothes and toys. That’s odd. Why would a burglar take some dirty old kids clothes? He runs into the master bedroom. His wife’s clothes are gone, but his are still there hanging in the closet. The bed is gone but his dresser remains. With a sinking feeling, he walks into the bathroom off the master bedroom. His wife’s things are missing. Not even a toothbrush is left. But his toothbrush is right where he left it that morning along with his other belongings. At this point, the truth hits him like a crushing blow. It is worse than being robbed. His wife left him and she took the kids. But why? He thought they were happy. They had some troubles, sure, but so does every married couple. How could she do this to him? The kids? This can’t be happening! The next thing he knows, some big guy who looks like a cop is knocking at the door to serve him with a complaint in divorce and an order scheduling a hearing on child support and APL/spousal support. Talk about your worst nightmare. Unfortunately, I see this scenario happen every day. When it does, it is often a complete shock. This is something that only happens to other people, right? Whether you genuinely believed your spouse was happy, or failed to see the signs that now seem so obvious in hindsight, it has happened to you. Now what? First, set up a meeting with a divorce lawyer. Ask friends and family for a referral. Next, do a little damage control and prevention. Change the locks to the house. You don’t want your spouse coming back to the house when you are not there to take what little furniture you may have left or rifle through the legal documents your lawyer sends you. If her name is on the deed, she is legally allowed to access the house, but changing the locks is often a good deterrent. If you have joint bank accounts, close them. Especially if your paychecks are being deposited into them. Close all credit cards on which your spouse is an authorized user, even if it means you must agree to pay the balance. Change all passwords to all password-protected accounts. This includes, but is not limited to, your Apple or other phone accounts, emails, bills, online banking accounts, passcodes to all devices, etc. Next, get your papers in order and prepare for the meeting with your lawyer. Your lawyer will need to see tax returns and other pay information, statements on retirement accounts, investment accounts, etc. If you were not the one in the marriage who handled the finances, now is the time to educate yourself on these matters. When you have your initial meeting with the lawyer, talk to him or her about custody. When your children are used to seeing you every day, it is extremely important to maintain regular contact. Did your spouse take the children out of state, or move so far that it will prevent your ability to exercise your custody rights? If so, your lawyer will need to immediately seek special relief from the court. If not, you will want to file a complaint for custody in the county the children have lived in within the last 6 months. Most counties in PA have a long and drawn out custody process. In Allegheny County, we have the Generations Program which requires both parents (and children if they are old enough) to attend an Education session, then a Mediation session. Mediation is scheduled 4-6 weeks after the initial custody complaint is filed. If an agreement isn’t reached at mediation, then the parties attend a Generations Conciliation which is scheduled 4-6 weeks later. If no agreement is reached there, then in another 4-6 weeks, another conciliation takes place, this time with the judge. After that, another conciliation might be scheduled, but eventually the last stop is a custody trial. The courts force people to go through these steps because they want parents to make their own decisions about their own kids, and it is very traumatic for parties and children to go through a custody trial. Some cases are not possible to settle (Is your spouse a narcissist? If so, you may as well schedule a trial date), but most cases settle at some point during the process. If your case ultimately goes to trial, expect it to take about a year for your custody case to be finalized from start to finish. If you ultimately settle at a conciliation, it will still take months. Since it will likely take a long time to get a final custody order, ask the court for an interim (temporary) custody order. If you do not have an agreement or interim custody order that enables the children to see you on a regular, if not equal basis, then a status quo custody situation is created. Judges love to keep the status quo intact when the kids seem to be doing OK. It’s safe. Make sure that you are part of the status quo. Finally, make sure you are taking care of yourself. You’ve just gone through a terrible shock. You likely feel stressed, depressed and anxious about the future. Don’t worry. You can (and will) get through it if you help yourself. Eat healthy and exercise. Try to get the appropriate amount of sleep. Don’t hesitate to get into counseling if needed. Do whatever you have to do to get your mind right. You are going to be making decisions about your children, finances, etc. that will affect you for years to come. You must be able to make these decisions based on logic rather than emotion. Your wife, furniture and cat might be gone forever, but if you follow these steps, you are on your way to maintaining a loving relationship with your children and protecting your assets. This does not have to the tragic end to your story. In fact, it is not the end of your story at all. It is a new beginning. It is January, which is affectionately known by family law lawyers as divorce season. More than any other month, internet search engines experience a surge of people searching for information relating to divorce. Divorce is a life changing and often traumatic event in one’s life; the very thought of leaving behind the life you’ve known can be overwhelming. How are you supposed to make a decision that will substantially impact you, your spouse, children and even extended family members without first consulting the internet? As a compulsive googler myself, I understand the lure of a free and anonymous internet search, especially when you are desperate for answers about something. But I can tell you that the internet does not have all of the answers you need to make informed decisions. Only an experienced and capable family law lawyer can do that after meeting with you and learning the facts of your unique circumstances. Divorce – to file or not to file? In some cases, however, it does make sense to file for divorce right away. It depends on the circumstances. Make sure to talk to your lawyer about your options. When I meet with a client for the first time, one of the first things I decide is whether to file for divorce right away. For a financially dependent spouse, it is generally better not to file for divorce right away, and this can be for several reasons. For instance, once you are divorced, you cannot be covered under your spouse’s health insurance any longer. Finding affordable healthcare, even through employment, is a common problem. In those cases, if makes sense to delay the divorce for as long as possible to keep health insurance coverage. Money – If you are not working outside of the home, do you have education or skills that will enable you to get a self-supporting job? If not, will child and spousal support (if applicable) be enough for you to live on, maybe with a part or full-time minimum wage job, on a temporary basis? Come up with a budget and stick with it as best you can. If you do not have the skills or education to support yourself, now is the time to come up with a plan to become self-supporting. Child support doesn’t last forever, and alimony usually doesn’t either. Think about what you are interested in. Look into the programs offered at the local community college. See what job training is available in your area, or even look into that graduate program you put on the backburner to start a family.The next thing I talk to my clients about is their income situation. If you want to leave your marriage, you must first take a long and hard look at your finances as this will determine where you (and your children if you have any) will be able to live when you and your spouse separate. Do you want to stay in the marital residence? Can you afford the mortgage, taxes, insurances, rent, etc. based on what you earn? If not, will you be able to afford to live in the house, with spousal and child support (if you are entitled to receive them) to supplement your income or lack thereof? In many cases, both incomes of the parties are needed to make the monthly mortgage payment. Decide where to live – If remaining in the marital residence is not an option, either financially or legally, you should strongly consider staying with family or friends. Moving out of the marital residence does not mean you give up your legal rights to the marital residence. Whether you live there or not, you still have an interest in the property meaning any equity will be distributed in some way once the marital assets are divided later on through the divorce process. This is a question I get asked all of the time. The children’s school district is also a major factor to take into consideration for most cases where shared custody is going to be an issue. If you can’t afford to live anywhere else but with family, and your family lives so far away that it would be difficult for your spouse to exercise custody rights, do not make any moves without consulting a lawyer first. Once I help my client analyze their income and budget, I help them decide where they should live. Once you’ve done the same analysis, can you afford to reside in the marital residence? If so, is your spouse willing to leave? If not and the deed to the house is in both names, you can’t just kick your spouse out. There are ways to gain exclusive possession of the marital residence (a topic for another day), but it is usually easier and cheaper to move out of the marital residence yourself. The move If this is not an amicable separation, or domestic violence is an issue, then I suggest moving out without telling the other spouse. You should still schedule the moving date, and have people to help you, but wait to move until your spouse is at work or out of town. Take whatever furniture, household goods, Christmas decorations, heirlooms, etc. that is important to you and/or will be necessary to set up a new home for yourself and/or your children. You may feel guilty pulling a surprise move like this, but if it will avoid a major conflict, or someone getting hurt, it’s worth it. If reaching an amicable custody agreement is not possible, and you are the primary caretaker of the children, take them with you when you leave. This may induce your spouse to file a complaint for custody, but don’t be alarmed by that. If that happens, the courts won’t automatically hand your children over to your spouse, assuming that the children are not in danger in your custody. It just means that you and your spouse will go through the court process to establish a custody order, whether by agreement or court order, that is hopefully best for your children. Once you figured out your finances, and have decided where you are going to live, the next step is to plan the move. Schedule a move-in date and enlist family and friends to help you. Is this an amicable, mutually-agreed upon separation? If so, try to reach an agreement with your spouse ahead of time as far as how the furniture and household goods are going to be divided. If you have children, it would be ideal if you and your spouse could come up with a custody arrangement prior to moving. File for child and spousal support Right before you move out of the marital residence, see if you can withdraw funds from joint bank accounts, CD’s investments, etc. Don’t feel bad about it; you have to support yourself, you are entitled to joint funds; besides, and any funds you take will just be considered as an advance to you later. While anyone can file a complaint for support at the Domestic Relations Section of the court in their county, you should not go to the support conference/hearing alone. Hire an attorney to represent you. Immediately after you move out of the house, file for child and spousal support if you are entitled to it. In Allegheny and Washington counties of PA where I practice, it generally takes 4-6 weeks after a complaint in support is filed for a support conference/hearing to be scheduled, and then up to another 30 days after the court date for the wage attachment to take effect. For that reason, plan to not have any support monies for about 2 months. Help your childrenIf your children are struggling, seek counseling for them or reach out to the guidance counselor at school for support. Be patient. While the adjustment to their changed lives may take some time, it’s worth it for the children to come home from school to a happy, tension-free home each day. Once you separate from your spouse, help your children with the transition. Talk to your children, help them understand what is happening and encourage them to confide in you about their feelings. Never speak badly about your spouse to the children; it will make them feel awful. Instead, assure them that they are loved by both parents and that the separation is not their fault. It is true that children are resilient, but the transition will be a lot easier for them if their parents can be civil. Decisions on when to file for divorce (if you and your attorney decide to wait), how to split assets/debts, permanent custody arrangements, etc., will come later. For now, I hope this general guide helps you to come up with a sound, logical plan towards making that huge decision to leave an unhappy marriage. When you are ready, or you are feeling overwhelmed, meet with a family law attorney. He or she will help you come up with a plan so that you can be prepared to take those first steps. My Attorney Isn’t Doing What I Tell Her to Do – Isn’t She Supposed to be Working for Me? The question of how an attorney goes about representing a client is not a simple one. On the issue of loyalty, there is no question; if the attorney cannot be trusted to look out for his or her client’s best interests, that is an attorney-client relationship that should no longer continue. The attorney owes the client the duty of absolute loyalty, and if there is a question of who the attorney owes loyalty to, the attorney should step aside. This includes situations where someone else other than the client is paying the bill; the attorney can and must focus on what is good for the actual client and cannot share information with or take instructions from anyone else, without the client’s express permission. The issue generally presents itself in a different way, that is, the client lays out a course of action that they want to be followed or a legal position they want to take, to the attorney, and the attorney disagrees with the client’s request. Is an attorney required to do whatever the client instructs them to do? The simple and easy answer to the question is “no,” because the Rules of Professional Conduct adopted by the PA Supreme Court are binding on all attorneys licensed to practice law in PA, and these rules prohibit certain actions by an attorney which are considered to be prejudicial to the system of justice. We are not permitted to (individually or through others) present perjured testimony, file lawsuits which have no justification, or intimidate witnesses, to name just a few. What a lawyer should be doing for his or her client is listening closely to all aspects of the problem which brought the client to the lawyer in the first place, and then giving a reasoned analysis of that client’s situation and the options available to the client for resolving the problem. These options must include an analysis of personal factors, including costs, which limit the options available to the client. If there are children involved, the lawyer must consider and discuss with the client the effect on the children of the exercise of each option available to the client. It means that the lawyer must have an extensive “toolbox.” There is no one-size-fits-all solution to every problem. Each client situation or problem has its own unique issues. Then the lawyer must counsel the client on his or her recommendations for solutions of the client’s problem. Most people have heard the old saying, “a good lawyer knows the law; a great lawyer knows the judge.” I finally came to peace with that saying; for years I thought it meant that a lawyer should develop some sort of “buddy” relationship with a judge to seek to influence his or her decisions because of their personal relationship, and I thought it was a repugnant idea. However, I finally came to understand what the saying means. It doesn’t mean that there should be a personal relationship between the lawyer and the judge; it means that the lawyer needs to take time to understand how the judge thinks about a particular kind of case by being attentive in that judge’s courtroom, talking to the lawyer’s colleagues, and studying the judge’s decisions, to be able to predict, with some degree of certainty, how a judge will rule on a particular type of case or in a particular situation. If the client doesn’t like what the lawyer says, he or she can move on and look for a lawyer who tells them what they want to hear. However, in the end the results will most likely leave the client unhappy. Lawyers, have courage! Clients, be smart! There is a difference between lawyers, and the truth is, if the lawyer is telling the client something they don’t want to hear, then that is very likely a great lawyer. In a previous blog post we discussed what to do when you find yourself thrown into contempt proceedings for failing to pay child support due to an unexpected loss of income, and how to defend against it by filing a petition for modification. But what can you do to avoid even the possibility of being swept into the nightmare that is contempt proceedings? The answer is obvious: pay your child support as ordered. In some cases where a child support obligor has lost his or her job, they have some savings to fall back on or friends and family willing to help out financially until they get back on their feet. If you are one of these people, you should still immediately file for modification of child support, but continue to pay the full support amount as ordered until you have your support conference/hearing. If you do that, you will at least avoid contempt, and eventually get back any money you might have overpaid. Except in some limited circumstances, child support is always wage attached, i.e., the employer deducts it right out of your paycheck and sends it to Pennsylvania State Collection and Disbursement Unit, or PASCDU, who then distributes it to the obligee. When you no longer have an employer to take care of this for you, it is your responsibility to make sure your child support gets to PASCDU on time. One major mistake people often make is paying the obligee directly by cash or check. DO NOT DO THIS! If you pay the obligee directly, then Domestic Relations in your county will have no idea that the support was paid. Not only will you not get credit for the support you paid, Domestic Relations will begin contempt proceedings against you if their system shows that you are behind more than 30 days. You must send child support payments to PASCDU! I had a case recently where I represented the Father in child support and other proceedings. For several reasons, the child support hearing did not take place until about 6 months after Mother filed. Although we had a temporary order in place in between that time, and Father’s wages were eventually attached, for many of those months he had to make direct payments to Mother. When we finally had the hearing and sought credit for the direct payments (about $5,000 worth), Mother claimed that Father never gave her the payments at all, and that the copies of the checks and money orders he produced were fake. Even after we eventually proved that Father did make the payments, Mother continued to refuse to give Father credit for them. Mother’s attorney was eventually able to get Mother to agree to give Father credit for the payments, but it cost him a lot of time, attorney fees and stress. It was certainly a lesson to him, and me as well. Have a question or ready to get started? Let’s talk. © 2019 Shah Law Group.